In some shape or form, as early as the 19th century Americans have been making dietary recommendations and heeding advice provided by experts. Soon after the initial discovery of individual vitamins in 1910, nutritionist Carolina Hunt’s 1916 “Food for Young Children” created new categories: milk and meat, cereals, vegetables and fruits, fats and fatty foods, and sugars and sugary foods. The first Recommended Dietary Allowances (RDAs) were created in 1941 for calories, protein, iron, calcium, and vitamins A, B1, B2, B3, C, and D. RDAs are now defined as the “average daily level of intake sufficient to meet the nutrient requirements of nearly all (97%-98%) healthy people.” The Food and Nutrition Board of the National Academy of Medicine also defined “adequate intake” (AI; “established when evidence is insufficient to develop an RDA and is set at a level assumed to ensure nutritional adequacy”) and “tolerable upper intake level” (UL; (maximum daily intake unlikely to cause adverse health effects”). In 1992 came the Food Guide Pyramid, with a particular focus on expressing the recommended servings of each food group based on their location within the pyramid. The first version of the infamous pyramid-shaped chart featured fruits and vegetables as the biggest group. But pressure from the grain, meat, and dairy industries led to the final version of the chart featuring brain, cereal, rice, and pasta as the foundation of the pyramid. 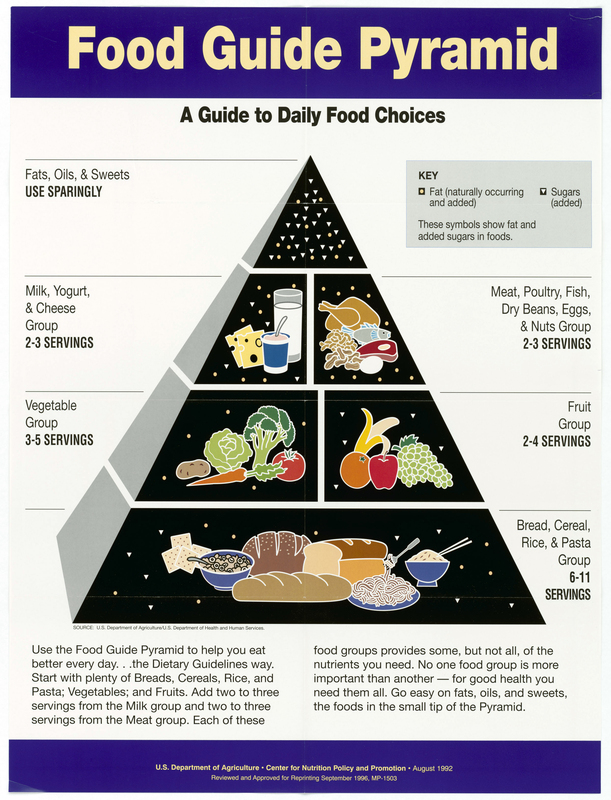 The Food Guide Pyramid was replaced with “MyPyramid” in 2005, which reverted to colorful vertical wedges and a running ascending the stairs to highlight the importance of exercise. Key criticisms of MyPlate stem from the fact that the chart does not highlight plant sources of protein like beans and nuts. A similar but more plant protein-centric chart is Harvard’s “Healthy Eating Plate,” which was created in response to deficiencies identified in MyPlate. I hope you’ll excuse my rant and accept assurance that I am of course aware that there are a lot of other factors exacerbating the issue of obesity (processed food, fast food, sedentary living and working, etc.). None of us were “in the room where it happens” back in the early nineties (yes, that’s a Hamilton nod), so we can’t say for sure why the Food Guide Pyramid was developed in the way that it was. I also think I’m particularly sensitive about this era of government dietary recommendations because this is the guide that I grew up with, and it was the first major educational exposure I had to what a healthy diet looks like. 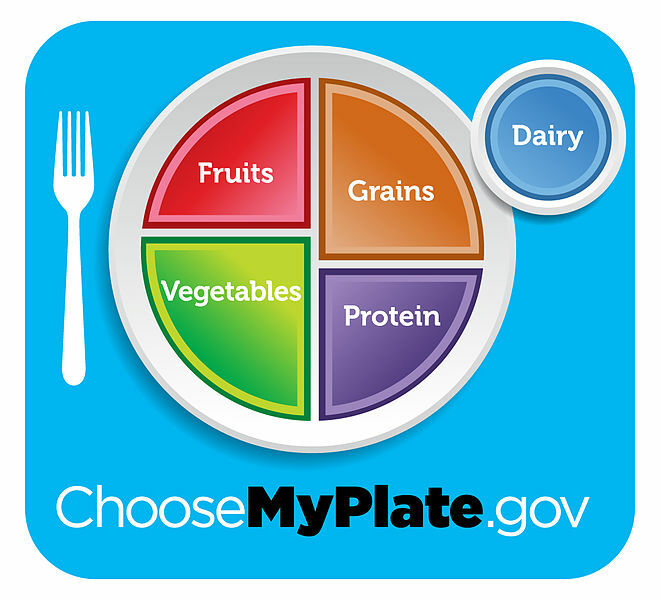 All in all, I do think that MyPlate is a great tool and shows that nutrition science (and the USDA) are moving in the right direction. My hope is that nutrition science and governmental recommendations will only get better and more accurate. Plus, did you hear about recent legislation proposed by democratic Congressman Tim Ryan to create a National Nutrition Institute under the National Institutes of Health? So cool.